Citation Information: J Clin Invest. 2006;116(1):217-227. https://doi.org/10.1172/JCI24497. 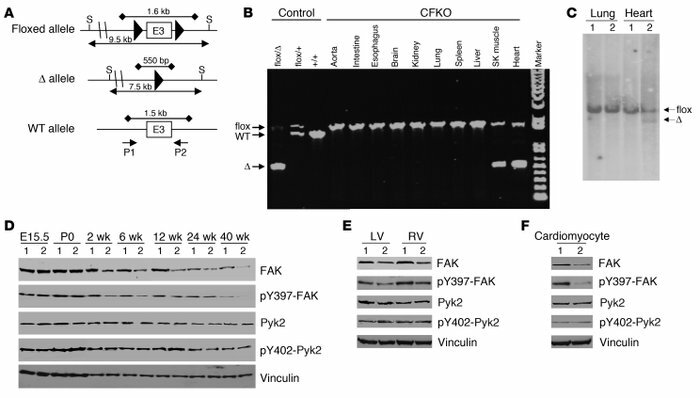 Ventricular cardiomyocyte–specific deletion of FAK. (A) Schematics of FAK WT, floxed, and deleted (Δ) alleles. Large filled triangles represent loxP sites. Horizontal lines with arrows indicate the expected sizes of DNA bands in Southern blotting of the floxed and Δ alleles. Horizontal lines with filled diamonds indicate the expected sizes of DNA bands in PCR. The location of the SacI (S) restriction sites and the primers P1 and P2 (arrows) are shown. E3, exon 3. (B) Genomic DNA from different tissues of CFKO mice were amplified by PCR with DNA from tails of various control mice (3 left lanes) as controls. The DNA bands corresponding to the flox, WT, and Δ alleles are marked on the left. SK, skeletal muscle. (C) Southern blotting analysis of the genomic DNA from lungs and ventricles of control (lane 1) and CFKO (lane 2) mice after SacI digestion. The positions of floxed and Δ alleles are marked on the right. (D) Lysates were prepared from ventricles of control and CFKO mice at different time points, as indicated. They were then analyzed by Western blotting using various antibodies, as indicated. (E and F) Lysates were prepared from LV, RV, or isolated cardiomyocytes from control and CFKO mice, as indicated. They were then analyzed by Western blotting using various antibodies, as indicated.